A couple months ago, I received a question regarding digital mode transmissions. 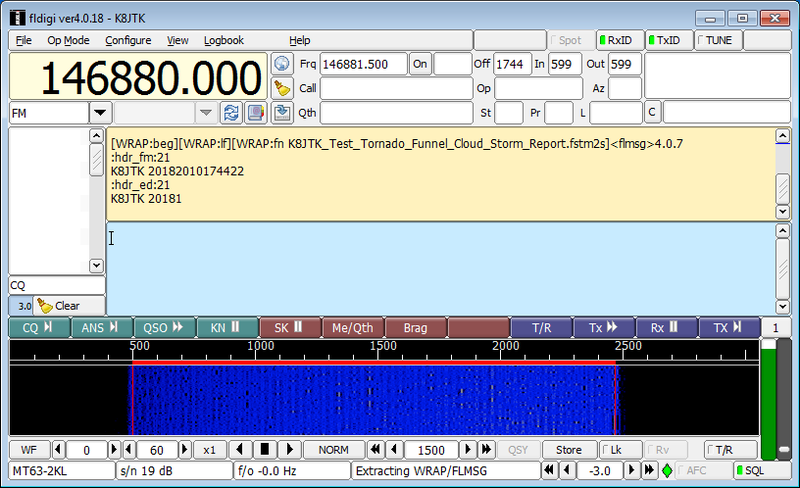 This ham was using Fldigi and wondered about “strange” transmissions at the start of a BPSK-63 transmission. BPSK-31 looked OK. The documentation link has a table of all RSID codes. Not all variations of baud, tones, and bandwidth are assigned a code because RSID is limited to a total of 272 unique codes. The programs listed support RSID, not necessarily all modes assigned an RSID code. Typically, that means the program will not react to codes for which it does not support. To detect RSID alongside the desired operating mode, digital programs will run a separate detector listening for these tones while the main detector focuses on decoding the selected mode. To receive RSID tones in Fldigi, the option on the main screen in the upper-right “RxID” needs to be green (enabled). The default behavior of Fldigi, I think, is a little weird. When an RSID is received, an announcement will be displayed in the receive pane (tan box). The blue clickable text takes you back to the previous frequency at the time the RSID was received. It does not move you to the frequency of the received RSID. 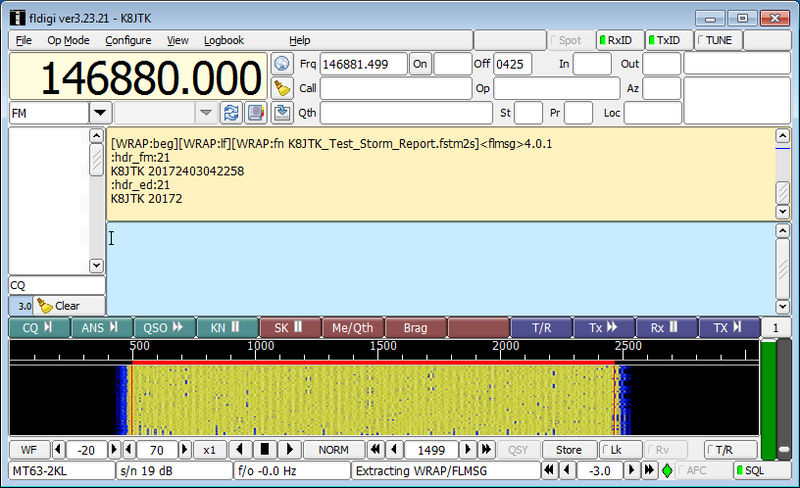 An example, RSID was received at 1300 Hz on the waterfall. The cursor is currently on 1500. The clickable link in the receive pane will return the cursor back to 1500. Fldigi will search for RSID in the vicinity of the cursor (about +/- 200 Hz), not across the entire waterfall. Useful configuration options are available in the Configure menu -> Other -> IDs. The “Searches passband” option will listen across the entire waterfall. “Notify only” will display a popup box when an RSID is received. You’ll have the option to click “go to” that frequency. Consequently, on the transmit side, “TxID” needs to be enabled for Fldigi to transmit RSID tones. Fldigi offers an option other programs don’t, transmit RSID at the end of the transmission. I don’t see much use for this as your signal is gone but someone might want to be ready for the next station in the exchange or break-in. Why wouldn’t a station see RSID tones for a (B)PSK-31 signal? Two reasons: PSK-31 is a common mode that most hams, who have operated digital on the air for any period of time, would encounter. No need to keep identifying commonly used digital signals. According to Fldigi, CW, RTTY, and BPSK-31 are the only supported ones that fall into this category. The second reason is bandwidth. Transmitting an RSID of 172 Hz will clobber more than a couple nearby PSK-31 transmissions. On the same configuration page, click “Transmission modes.” This list indicates which modes have RSID enabled. Clearing the checkbox will not transmit RSID for that mode. For example, operating a lot of BPSK-63 and the RSID annoys you, but not for MT63-2000, uncheck BPSK-63 in the list. 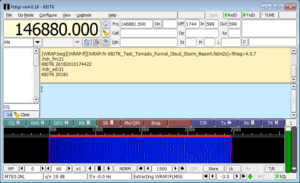 Transmitting RSID helps ensure receiving stations are tuned and decoded for modes like MFSK. Modes like JT65 have RSID tones but they’re not used during normal operation and could throw off the timing of the exchange. JT65 is also operates in designated windows of the digital sub-bands. It’s probably meant more for identifying EME transmissions using JT65. The ‘strange’ transmissions are not strange at all but rather letting others know which modes are being operated. There was a lot of FUD (that’s fear, uncertainty, and doubt) around the future of WWV back in September of last year. You can check my article in the September edition of the OSJ or on my website. While not yet signed, the fiscal year budget for 2019 does include funding all WWV stations. As it turns out, this year is the 100th year of operation. 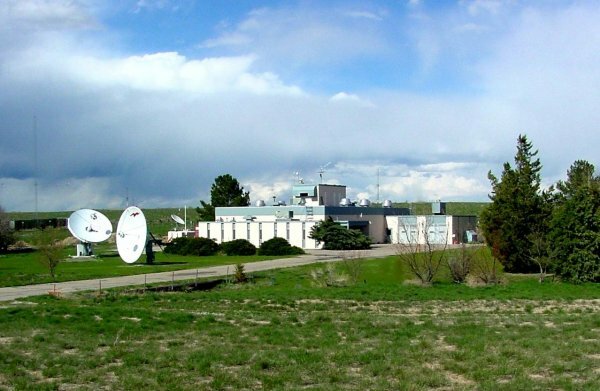 A member of the Northern Colorado Amateur Radio Club has met with NIST management and is planning a special event station between September 28 – October 2. I’ll be anticipating that event and hope to work WWV. Technical Specialist, Eldon – W5UHQ, has been busy playing around with FT-8 when he’s not doing the Ohio Digital Emergency Net. 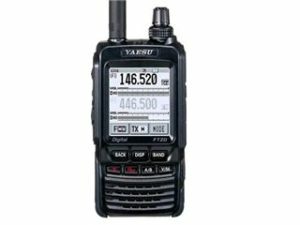 FT-8 was developed by Joe Taylor – K1JT and is the popular successor to the JT-65 & JT-9 modes. It has grown like wildfire due to the reduced time to make a contact, 15-second transmit windows compared to a minute, and the poor band conditions we’re experiencing. 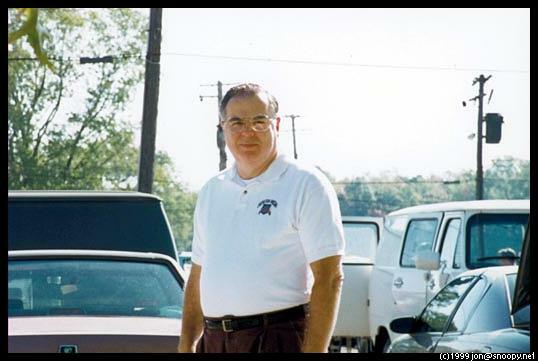 Eldon created documentation about setting up and operating with the WSJT-X software. 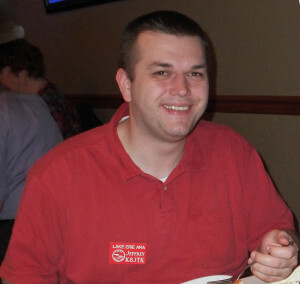 Last month he was asked to give a presentation for the combined meeting of the Central Ohio Operators Klub and Newark Amateur Radio Association. 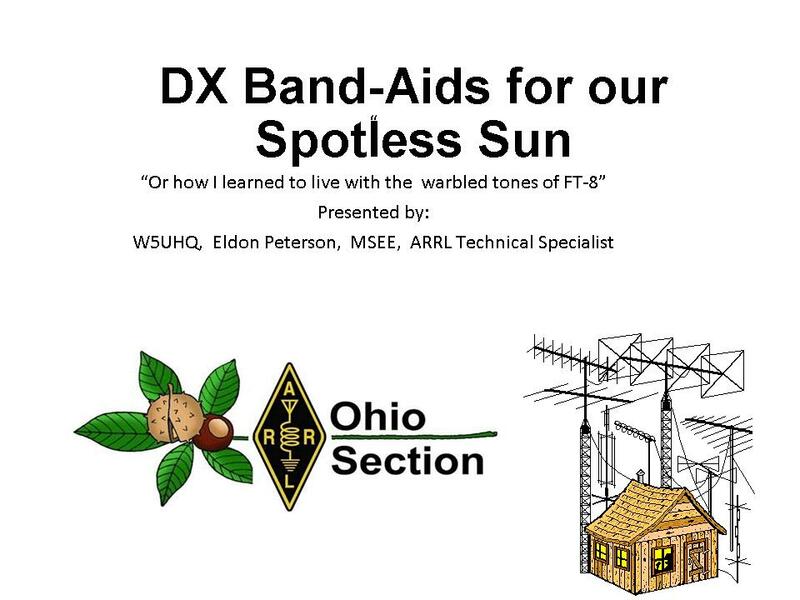 Eldon gave a very detailed presentation on FT-8 titled “DX Band-Aids for our Spotless Sun.” Nice play on words. With terrible band conditions, many believe FT-8 has kept interest in ham radio alive. His presentation is loaded with graphics and pictures – my kind of presentation. 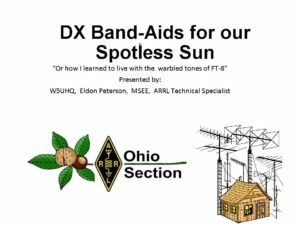 If you’re in the Columbus area and want a great presentation on FT-8, get in contact with Eldon. He’s been knocking out a lot of contacts with wanted DX entities like Ducie Island, Baker Island, and most recently Banana Island. If you use the WSJT-X software for the JT modes, a recent update to Ham Radio Deluxe allows logging directly to HRD Logbook. I set this up recently and it makes things a breeze with the faster pace of the FT-8 exchange. There is a YouTube video on the Ham Radio Deluxe channel showing how to configure both programs. A quick reminder, if you haven’t upgraded to WSJT-X 2.0 your software probably isn’t decoding any stations on FT-8 and MSK144. A major update to the program and protocol was released. Effective the first of the year, everyone should be using WSJT-X 2.0. The change increased error checking by 2-bits to help with special exchanges in structured messages. 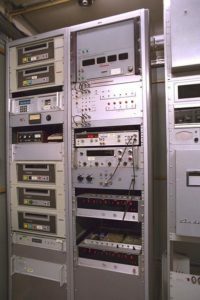 A couple days ago, I got a question from a ham about recording audio from their Ham radio. I’ve done this for various different reasons including streaming to the popular online scanner site Broadcastify, a net controller wanted an audio copy of the net, and posting audio clips online. There are a couple programs I’ve used over the years depending on the situation. This is very useful when documenting malicious interference or a bozo on a repeater. First, station setup. You’ll obviously need to be close enough to receive the station or repeater. Marginal signals or ones with static might sound “ok” when listening through the radio’s speaker but will sound worse when recorded and played back. White noise is created over all frequencies and will be recorded over all frequencies. A better gain antenna, one located higher, or a directional antenna would improve reception of the station. Trying to monitor your own signal through a repeater will require separation between the radio transmitting on the repeater input and the radio receiving on the output. Otherwise, the receiving radio will be desensed causing little-to-no signal to be received. 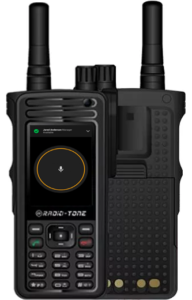 A base station, mobile radio, or radio scanner is best depending how long you plan to monitor the other station. An HT or portable scanner will work but will likely need an external power source. Find a radio with a 3.5mm standard headphone / speaker jack. Nearly all ham radios made in the last 30 years will have this. The speaker portion of a Speaker & Mic jack will be the 3.5mm connector. Newer modern radios utilize a soft power switch (meaning it doesn’t physically cut power to the device) but rather power state is controlled through electronics. Turn of any of these (or related) settings: auto power off, power save, and turn off display and keypad lights. APO turns off the radio when idle which will disrupt recording. Power Save reduces current drain on the radio but takes longer for the radio to respond when a signal is received. This results in a missed word or two at the begging of a transmission on the recording. Turn down or off LCDs or any display lights as there is no need to shorten the lifespan while the radio is used unattended. A 3.5mm to 3.5mm cable is need to go between the radio and computer or other recording device. These can be found at a local hamfest, on the Internet, or look at Monoprice for good prices. Either a TRS cable or TS cable can be used, these are known as a stereo or mono cable. The radio will often output only one channel. A radio connected to an audio interface, like for digital modes, is not ideal unless you’re monitoring sideband or AM. Audio from the digital port will be un-squelched and nearly impossible to utilize VOX or sound activated features. Recording to a PC is the most versatile solution. Plug the audio cable into the Line In jack of the PC. 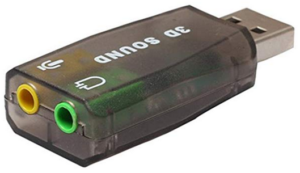 If another sound card is needed, the very cheap USB sound cards available for a couple bucks will provide another audio input. In my experience, audio out of these inexpensive USB sound cards is very noisy while the audio input is quiet. Don’t need audio out so the noise problem doesn’t matter. The audio/speaker out level from the radio will be adjustable via the volume control. Set that at about half or 50%. On the computer, go into the Sound settings in the Control Panel. 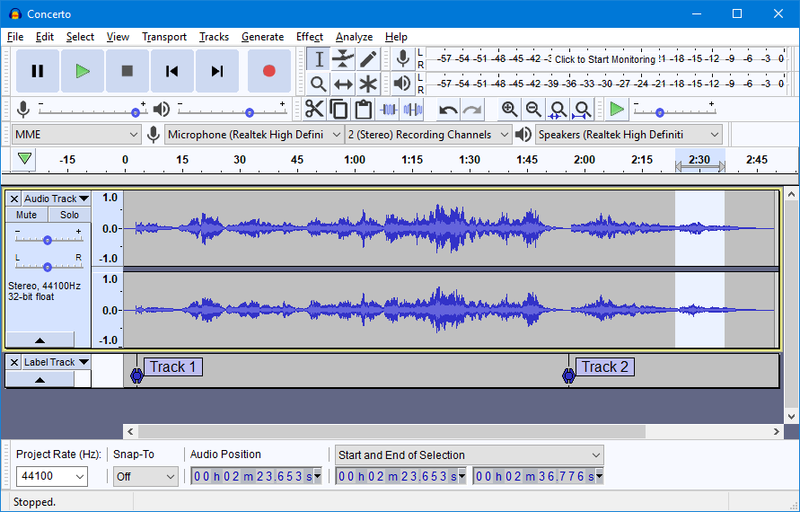 On the Recording tab, find the audio device – “Line In” on most PCs, “Microphone” on the USB devices. Set the Level to 50 in Windows. Linux doesn’t seem to distort audio as much and can be set at 100%. Line In audio may need to be boosted while Microphone connections will likely need to be turned down. The setup I have with the inexpensive USB sound card is set at 7 (out of 100) with the radio at 50%. VOX is a voice activated switch in traditional radio operation but it’s really an audio level reaching some threshold which then activates the transmitter. In this context the program would start recording. VOX is nice because it eliminates long pauses on FM. A repeater may only be used 10% a day. The resulting recording will not be 90% dead audio. VOX is useful but may miss a second or so before initiating recording. 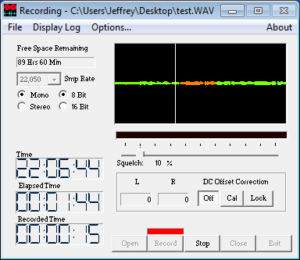 Long pauses during the transmission, where the audio would fall below a threshold, will stop recording momentarily. When the VOX threshold is set too low, you may record unwanted static bursts. HF is very difficult to set a threshold because there is no squelch on sideband. Some kind of log is useful to determine when a repeater is used or will be needed for documenting interference issues. Another option is a real-time recording. A lot of extra hard drive space is required for these extended audio recordings in real-time. A more on this later. 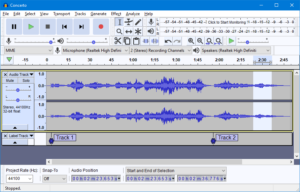 For Software, Audacity is pretty flexible and free. It can do real-time, timer recording, and VOX. Once Record is pressed, it will run until it’s out of hard drive space. The Timer Recording feature will start at a specific time and continue for the duration. This is useful when recording a net. Timer is found under Transport -> Recording -> Timer Record. The VOX-type feature called “Sound Activated Recording” is found under Edit -> Preferences -> Recording. It does not have a logging feature, though. The program I like for monitoring a repeater is Scanner Recorder. It is a VOX program that is simple to use but configurable enough to delay a couple seconds after the signal disappeared. The clock, amount of time elapsed since recording began, and length of recorded audio is quite nice to see how busy is the frequency. 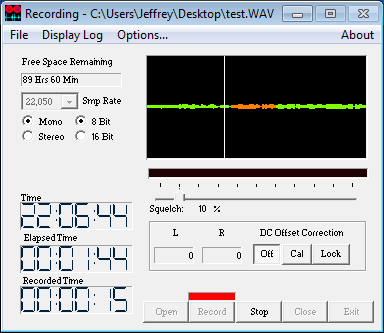 It does have a logging feature showing date, time, duration, and relative time in the audio file. When using VOX, the per-hour rate only applies when the program has recorded an hour of audio. The ham asked about recording with a rolling buffer. A rolling buffer would record over itself when it reaches a specified length. I don’t know of any programs that will accomplish this but I did find an Android app called Echo that seems to meet the requirement. It’s not available through the Google Play store, unfortunately, requiring the alternative app store F-Droid to be installed first. Do plenty of tests and dry-runs first to check audio levels for overmodulation of the recording. You can use this setup for fun, documenting interference and bozo issues, or for finding out how often a repeater is used. On second thought, you probably don’t really want to know the answer. A couple years ago, Medina county asked me to create a training session for them on how to use Fldigi specifically for NBEMS. Recently, Lorain county ARES encouraged participants to utilize NBEMS methods. NBEMS stands for Narrow Band Emergency Messaging System. 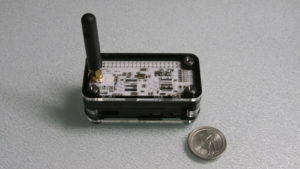 It is a set of standards for the ham radio community to communicate with each other using text and E-mail type traffic. Standards are good to have so there is not a situation where different groups use different digital standards and cannot communicate between themselves. Inexpensive. All can participate. Older computers can be used. Simple. No steep learning curve in an emergency situation but flexible. To make digital interaction possible: a radio, computer, interface between the two, and software to tie it all together is needed. 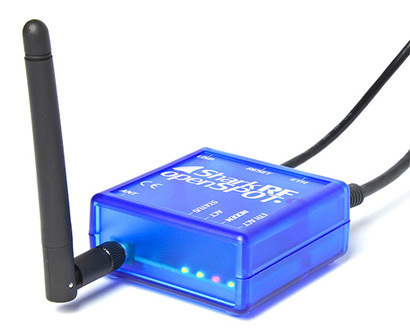 An interface is typically a device like the SignaLink or RigBlaster. One nice thing about NBEMS, it’s possible to operate MT63-2KL by holing your radio up to the computer. This means a separate interface is not required. It’s great in a pinch but doesn’t provide an ideal operating situation. Fldigi is a modem application. It modulates and demodulates – what sounds like noise – into data. Flmsg, used in conjunction, is a forms manager. It allows you to create and reply to standardized forms and verify reception through a checksum. A checksum is an algorithm used to detect errors in storage or transmission. 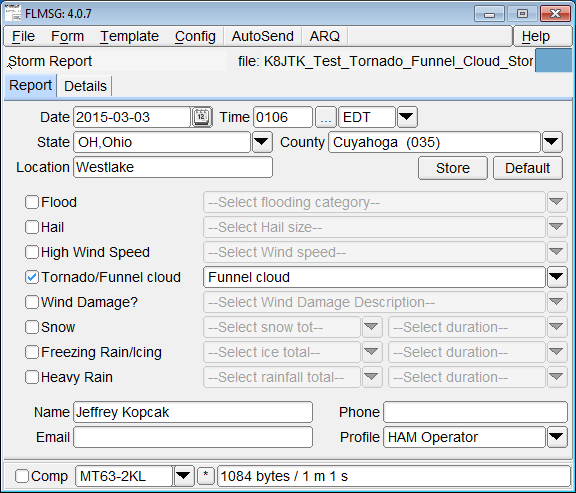 Standard forms included are ICS, IARU, Radiogram, or the ability to send CSV data. CSV is a plain-text file that stores tabular data with each line being a single record contains one or more fields separated by commas. In NBEMS, CSV is a low-bandwidth way to transfer Excel documents without formatting and extra Meta data. As an example: a Excel document can be 17 kB in size but the same data exported to plain-text CSV is only 5 kB. Tim – NC8OS, EC for Lorain, asked if I would give an Fldigi training session, which I was more than happy to do. A few years passed since I gave similar training in Medina. A number of changes have happened and it was time to update my presentation. Changes include much more frequent (and not always stable) Fldigi and Flmsg updates, changes in work flows – especially within Flmsg, and I have gained more experience interacting and interfacing with digital nets across the country. Fldigi had some cosmetic changes, mostly around the menus and configurations. Workflow changes in Flmsg seem like they could be beneficial but were poorly implemented. Luckily, we can go back to familiar behavior. Most important lesson I’ve picked up: all these whiz-bang things are tools. This or any other technology needs to be played with to figure out how it can be best utilized (offering a real advantage), how it can be utilized efficiently, and have people who know how to use these tools. Groups are finding digital operators are ones who have the least amount of problems and greater success during drills than someone who hasn’t opened the application in 6 months. This, too, means someone who wants to become successful needs to practice, practice, and practice by operating, participating in practice nets or starting one if one is not available. For my presentations and training, I feel people get much more out of a hands-on session. I encouraged participants to bring their stations or go-boxes which helped facilitate a great question and answer session to address a good number of problems. Eric – N8AUC, DEC for District 10, was on hand to answer questions as well. We accomplished a lot, answered a lot of questions, and got them on the right track. I learned that I need to be figuring out interactions with this combination of hardware, software, and Windows 10. As more people are upgrading, replacing computers, or purchasing new devices this means more questions and issues will center on the most widely used operating system platform. Though I have stopped using Win 10 in favor of Linux, I do need to spend time with it to better answer those types of questions. Thank you to Lorain ARES for allowing me the opportunity to pass on knowledge about digital and NBEMS. My presentation is available online on my website. Contact me about setting up a training session with myself or a Technical Specialist if you would like to host a session on NBEMS. Speaking of Technical Specialists, another meeting night idea for your club is to hold a “Test and Tune Night.” Dave – KD8TWG hosted one of these events for LEARA. It usually ends up being a “Test and Test Night” because the operating manual does not have the information on how to make adjustments. Those are found in a Service Manual. Professional test equipment was on hand including Service Monitors, wattmeters, and analyzers to test radios, scanners, and coax. Dave could tell you if that $30 Baofeng is compliant with spectral requirements. VERY good chance it won’t be. Dave reminded all of us that Part 97 certifies us as operators to be compliant with the rules. This allows us to build our own radios and not have to do something crazy like file a testing and compliance report with the FCC for a home brew project. Just because the radio ‘sounds good,’ ‘does everything I need,’ or ‘was cheap’ doesn’t mean it works correctly especially when transmitting. It is up to each of us as hams to make sure our equipment is compliant. Contact Dave or myself to help get a Test and Tune night for your club. It’s that time of year again! For the 13th consecutive year, The 3916 Nets will be presenting The Santa Net on 3.916 MHz. 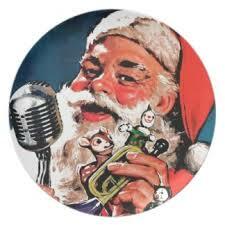 Good girls and boys can talk to Santa Claus, via amateur radio, nightly at 8:30 PM (Eastern) starting Friday, November 23, 2018. The Santa Net will run nightly at 8:30 PM Eastern through Christmas Eve, December 24, 2018. This fun opportunity is great for connecting kids or grandchildren with the Head Elf himself. Details and updates will be made via their Facebook group: https://www.facebook.com/3916santanet/. Archive reason: domain expired, server shutdown, or otherwise unaccessible. I do not take any credit for the content or make any claim of accuracy. NBEMS ( Narrow-Band Emergency Message System ) is perhaps the best solution available for moving eMail and other text-based information over amateur radio frequencies, to handle emergency communications. Here I will outline the reasons that I have come to this conclusion after reviewing the available amateur radio messaging systems. Our mission is simple. – To provide an alternate means of moving messages into and out of a disaster area where regular internet access has become compromised, is limited or nonexistent. For this purpose, it is seldom necessary to transport messages or eMail via amateur radio any farther than 100 miles or so, or to move any great volume of data. It is important however that the messages get through with 100% accuracy, and in a timely manner. In most cases, this service will be needed for anywhere from a few hours up to several days. For amateur radio operators, the best method is to utilize the radios, software and equipment that we use every day for ham radio, and so are already familiar and comfortable with. The system should be inexpensive and easy to use so that all amateurs may participate, and are not faced with a steep learning curve in order to be ready to act in an emergency. Extensive training and drilling should not be required in order for hams to function well when needed. There also should be some flexibility to handle different needs of unexpected situations that may be encountered. The system should work independently of existing infrastructure, and require no costly and complicated infrastructure of its own. I have reviewed the amateur radio eMail and messaging systems in current use, and have found that NBEMS best covers the mission parameters and the considerations for amateur radio operators outlined above. 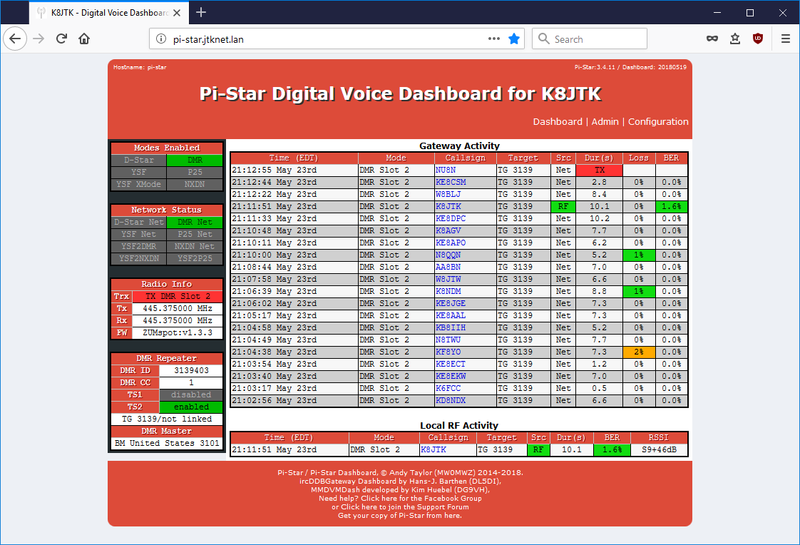 NBEMS was developed as a collaborative effort between Dave Freese W1HKJ and Skip Teller KH6TY, the developer of the popular DIGIPAN PSK31 software. It consists of a suite of programs that send text, images and eMail files error-free. The two main programs, FLDIGI and FLARQ are designed to run under Linux, Free-BSD, Mac OS, Windows XP, Win2000, Vista and Windows7. The NBEMS system is designed to operate on all amateur bands, but is optimized for short to medium range communications such as SSB VHF, or HF with an NVIS antenna can provide. 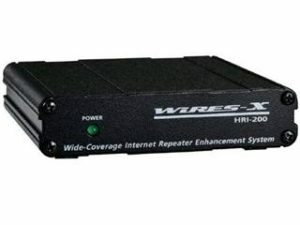 It can also be utilized on VHF FM, and even operated through a FM voice repeater at need. Digital modes currently recommended for HF NBEMS operations are: OLIVIA 8/500, OLIVIA 16/500, MT63 1k, PSK-125R and PSK-250R. For VHF use on simplex or through a repeater, MT63 2k is recommended and can be used to good effect without a soundcard interface. The free FLDIGI multimode soundcard software offers many digital modes, but the modes listed above are most often associated with NBEMS. Amateurs who use FLDIGI for everyday QSOs in PSK31, Hell, Olivia, MT63 etc. will be familiar with the software when occasion calls for the NBEMS system to be called up. 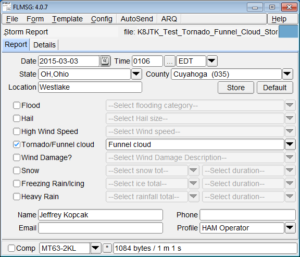 An optional part of NBEMS is the FLARQ software, which provides the interface to your eMail program, and which also provides the ARQ feature for NBEMS which gives you 100% accurate transmissions of the messages and images you transmit. In addition to email, you can send comma delimited spread sheets/data bases, text, and many ICS form-based messages. The FLWRAP add-on program allows you to transmit a bulletin to an unlimited number of stations simultaneously. Each recipient can confirm individually whether they have received the data with 100% accuracy, as FLWRAP generates a checksum for each message. The FLMSG program makes authoring, sending and receiving text, ICS-205, ICS-206, ICS-213, ICS-214, and ICS-216 forms in addition to ARRL Radiograms a simple point and click proposition. Technology (NIST). WWV is the oldest continuously-operating radio station in the United States. 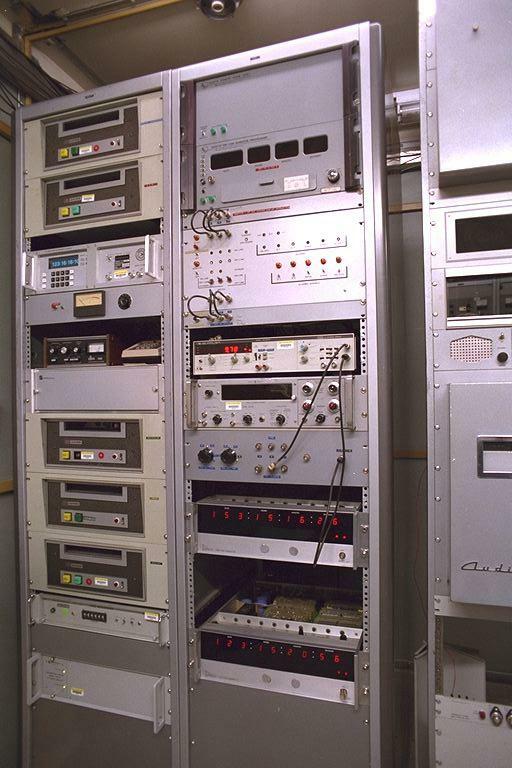 It transmits time signals and bulletins in voice and digital formats on 2.5, 5, 10, 15, and 20 MHz AM 24/7/365. 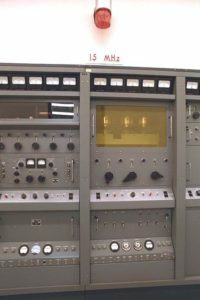 The time and transmitted frequency of WWV is controlled by atomic clocks which are the most accurate standards due to the use of atoms as a time keeping element. Not only is the time broadcast by WWV the most accurate but the frequency of the transmitters is also the most accurate. WWVH is the Hawaiian sister station to WWV. 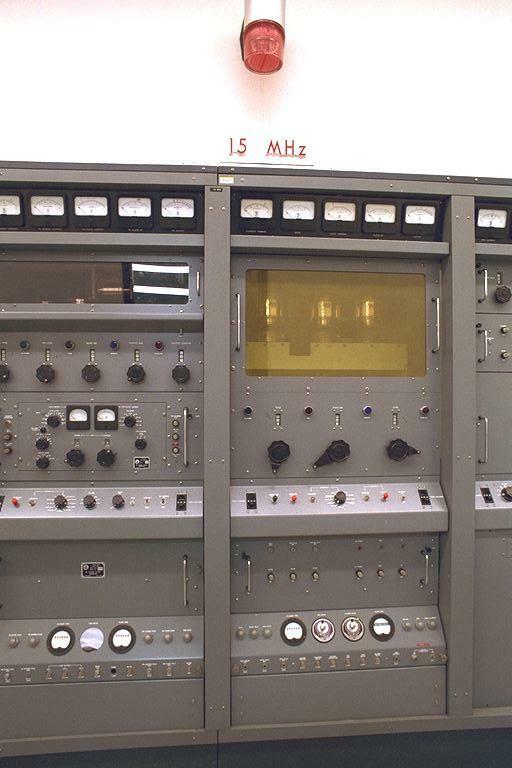 WWVB is co-located with WWV but broadcasts a constant time code for radio-controlled clocks on 60 kHz. This is the frequency clocks that automatically set themselves listen to. Both WWV and WWVH announce Universal Coordinated Time (UTC) each minute and broadcast other recorded announcements including GPS health reports, oceanic weather warnings, and solar activity bulletins. 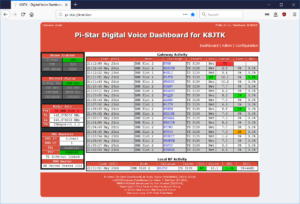 Whether you use these stations to calibrate equipment and instrumentation, calibrate ham radio digital software and hardware (Slow Scan TV or Fldigi), listen to bulletins, or use it as a beacon to check propagation, all of that is likely to end. NIST has proposed shutting down, by way of defunding, the WWV stations in their 2019 budget proposal. This means the 2011 NIST estimation of 50 million radio-controlled clocks and wristwatches equipped to receive WWVB will become obsolete. Not to mention it is an instrumental part in the telecommunications field and in scientific research. At first, WWVB was not listed in initial stories which made sense. Continuing to operate it would not obsolete radio-controlled clocks. But it too started to appear in later news stores. In the ARRL report, the reason given for defunding these broadcast stations would be to “consolidate and focus” on other programs due to reductions in NIST funding. Taking the WWV stations off the air would save $6.3 million. The NIST FY (fiscal year) 2019 budget request for efforts related to Fundamental Measurement, Quantum Science and Measurement Dissemination is $127 million, which, the agency said, is a net decrease of $49 million from FY 2018. The administration’s overall NIST budget request is more than $629 million. A whopping $6.30! $6.3 million is almost 1% of the total proposed 2019 NIST budget or 0.00016% (rounded) of 2017 total expenditures. Yeah, it’s a HUGE burden! I got pretty upset and there was noted concern over the shutdown proposal, especially amongst hams as would be expected since we utilize the service probably more than others. I figured everyone wouldn’t want their wall clocks to stop setting the time automatically. However, reality set in as the petition started at whitehouse.gov didn’t gain much traction. As of this writing, with less than 3 days before it closed, it gained a little less than 19% of the needed signatures for the White House to respond. Note: OSJ publication date will be after the petition closes. What happens next? I haven’t heard if the dial-in phone numbers for WWV will be shut down or remain accessible: (303) 499-7111 for WWV (Colorado), and (808) 335-4363 for WWVH (Hawaii). Phone systems are converting to data services (VoIP) and there will be slight delays due to network switching, latency, and loss. If the phone numbers remain available, it will be better than nothing. Canada has a similar time standard called CHU on 3.330 MHz & 14.670 MHz at 3 kW and 7.850 MHz at 10 kW. The 3 MHz station was strong into NE Ohio on one Thursday night as I’m writing this article. I’m also making the big assumption CHU will remain on the air. CHU broadcasts are AM with the lower side-band suppressed. Unfortunately, Canada doesn’t have the equivalent of WWVB and they relied on the U.S. for their radio-controlled clocks. Go U.S.! In other parts of the world, radio-controlled clocks rely on MSF in England and JJY in Japan. Radio-controlled clocks will switch to some sort of other technology, likely GPS, listen for a cellular signal, or piggyback on WiFi. Radio-controlled clocks I’ve used set themselves in the middle of the night at about 3AM. Figuring most electronic noise emitting devices (like computers) would be off and longwave reception is better at night. GPS will reduce clock setup by one step. You won’t have to tell the clock in which time zone it is located. Ooohhh, yeah – that was so much work! I’m skeptical about using GPS. Any time I bring my car GPS into the house, it “lost satellite reception.” Being internal to a steel building (like an office), I do not see how this works at all without bringing the clock to the window to resync. More skepticism comes in the form of a question: what happens when the U.S. developed GPS system is unavailable? It could be unavailable because of solar flares, software bug, or an act of a nation-state. If you haven’t seen Dr. Tamitha Skov – WX6SWW’s solar reports, GPS is significantly affected by solar flares just like our HF bands, but in different ways. There are commercially available car navigation devices and smartphones that are capable of receiving both U.S. GPS and Russian GLONASS. Consider other parts of the world are developing their own global navigation systems and not relying on one single system, Europe: Galileo & China: BDS. Computers and other Internet connected devices are not affected by the WWV shutdown. They utilize the Network Time Protocol (NTP) from publicly available time servers for syncing time. I hope the best for WWV, WWVH, and WWVB. Maybe a private entity will buy out and continue to operate the stations. Nothing is looking too good without outrage from the public or more support than the few that signed the online petition. I’m getting tired of forced obsolescence. Around the time of Dayton, the FBI asked everyone to reboot their routers. Why would they do that? Over the last two years more than 500,000 consumer and small business routers in 54 countries have become infected with a piece of malware called “VPNFilter.” This sophisticated malware is thought to be the work of a government and somewhat targeted with many of the infected routers located in Ukraine. Security researchers are still trying to determine what exactly VPNFilter was built to do. So far, it is known to eavesdrop on Internet traffic grabbing logon credentials and looking for specific types of traffic such as SCADA, a networking protocol controlling power plants, chemical plants, and industrial systems. Actively, it can “brick” the infected device. Bricking is a term to mean ‘render the device completely unusable’ and being as useful as a brick. In addition to these threats, this malware can survive a reboot. Wait, didn’t the FBI ask all of us to reboot our routers? Won’t that clear the infection? No. In order for this malware to figure out what it needs to do, it reaches out to a command-and-control server. A command-and-control server issues commands to all infected devices, thus being “controlled.” C&C, as they are often abbreviated, allows the bad guys in control a lot of flexibility. 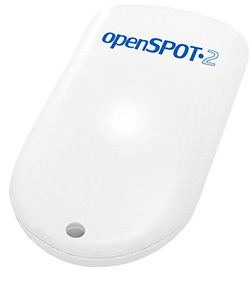 It can allow infected devices to remain dormant for months or years. Then, the owner can issue commands to ‘wake-up’ the infected devices (called a botnet) and perform intended tasks. Tasks can range from attack a site, such as DynDNS which I wrote about in November of 2016, to steal logon credentials for users connected to the infected router. Back to the question, the FBI seized control of the C&C server. When an infected router is rebooted, it will try to reach out to the C&C server again but instead will be contacting a server owned by the FBI. This only gives the FBI a sense of how bad this infection is. Rebooting will not neutralize the infection. Affected devices include various routers from Asus, D-Link, Huawei, Linksys, MikroTik, Netgear, TP-Link, Ubiquiti, Upvel, and ZTE, as well as QNAP network-attached storage (NAS) devices. 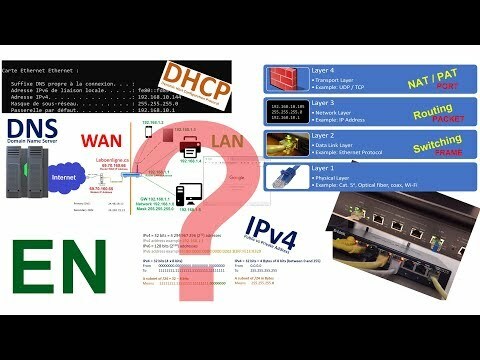 There is no easy way to know if your router is infected. If yours is on that list, one can assume theirs is infected. As if that wasn’t bad enough, many manufactures don’t have firmware updates to fix the problem. The ones that have fixed the problem did so years ago. Since no one patches their routers, that’s why there’s half a million infected. First thing to do is gather information about the make, model, and current firmware of your router. Then check for announcements from the manufacturer about affected firmware versions or preventative steps. The only known way to clear this infection is to disconnect it from the Internet, factory-reset the router, upgrade the firmware (if one is available), and reconfigure it for your network – or simply throw it away. See if your ISP has a device they will send or install for you. It can be reasonably assumed that devices provided or leased by the ISP will be updated by the ISP. Use 3rd party firmware. Currently they are not showing signs of being vulnerable to VPNFilter or other infections. 3rd party firmware projects are often maintained by enthusiasts. They are updated LONG past when the manufacturer stops supporting their own products and updates often happen quickly. Some of those projects include: OpenWRT/LEDE, DD-WRT, or Fresh Tomato. 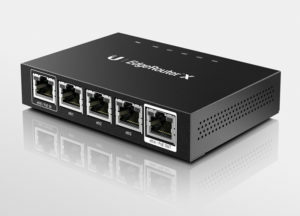 A Linux box could be setup with Linux packages to mimic router functionality or use a distribution such as pfSense or OPNsense. Another great device to use is the Ubiquity EdgeRouter-X for $49. Check the “Comparison of Firewalls” for other ideas. That $5 hamfest deal isn’t sounding so great anymore. It’s the law of economics for these companies too. $10, $30, or $100 for a device isn’t going to sustain programmer’s time to find, fix, troubleshoot, test, and release firmware updates for a 7-year-old device. It’s a struggle. I think it will come down to spending more on better devices which will be upgraded longer or spend $50-$100 every 3-5 years to replace an OK one. The Department of Commerce released a report on the threat of botnets and steps manufactures could take to reduce the number of automated attacks. It hits on a number of good points but lacks many details. “Awareness and education are needed.” Whose responsibility is it to educate? I can write articles in the OSJ but I’m not going to be able to visit everyone’s house and determine if your devices are infected. “Products should be secured during all stages of the lifecycle.” Automated updates could take care of this problem but doesn’t address what-ifs. What if the update fails or worse yet, bricks your “Smart” TV as an example? Who is going to fix or replace them? Will they be fixed if it’s out of warranty? Not to mention operating system “updates” are bundled with more privacy violations and ways to monetize users. There’s a lot of work to be done. I wish I had the answers. Regardless, we all need to be good stewards of the Internet making sure ALL attached devices are updated and current. Finally this month, thank you to all the clubs and groups that sent messages to this station via WinLink or NTS over Field Day weekend. It was the most I’ve ever received, about 12 – 15 messages altogether.